Home / Interior Design / The kitchen renovation begins! We also bought a couple of kitchen cabinets that we found on Craigslist. One that is 27 inches wide so we can fit the dishwasher next to the sink, and one that is 30 inches to replace the 33 inch one that’s over the stove. It always bugged me that the cabinet was three inches wider than the range hood, so now that won’t bother me. We scored the cabinets for $10 a piece, so that helped the reno budget. Granted, they don’t match exactly, but that’s okay, because they’re going to be painted white anyway. 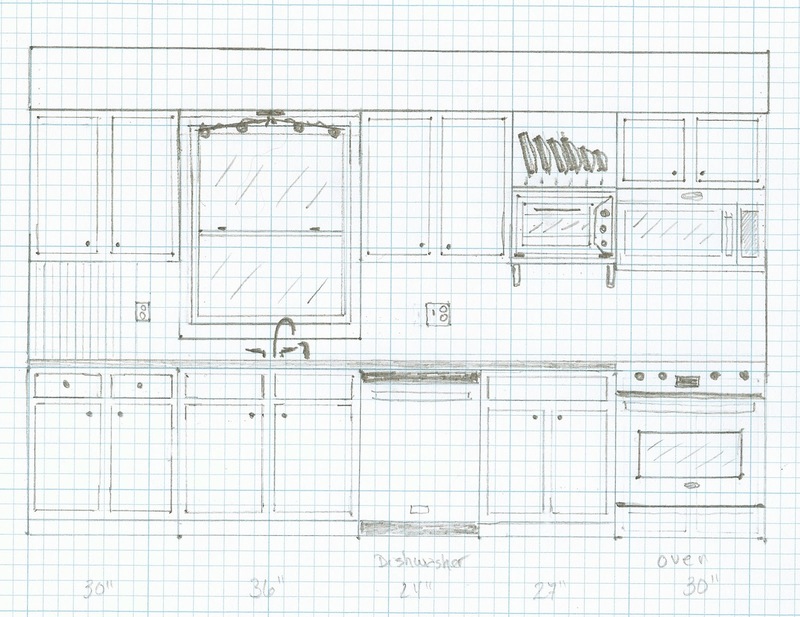 My drawing of the kitchen–pretty close to scale, but not quite. I’ve been planning this renovation on paper for several weeks. 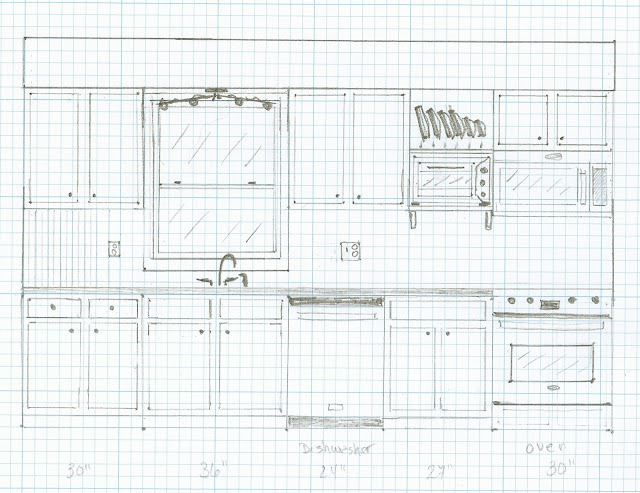 As you can see from my drawing, we have a small kitchen, because that’s seriously how wide our kitchen really is. No room for expansion. But that’s not necessarily a bad thing. Small kitchens mean fewer steps when cooking. The far left base cabinet and the sink cabinet below the window are staying where they are. The two upper cabinets on either side of the window are also staying where they are. Right now there is a wooden valance between the two upper cabinets that is coming down and a new light fixture is going there above the sink. I’m pretty sure we’re going to go with the one below from Lowe’s unless I find one I like better. It fits the space, has the leaf design I like, and the arms are adjustable, so I can put the light where I want it on my work surface. 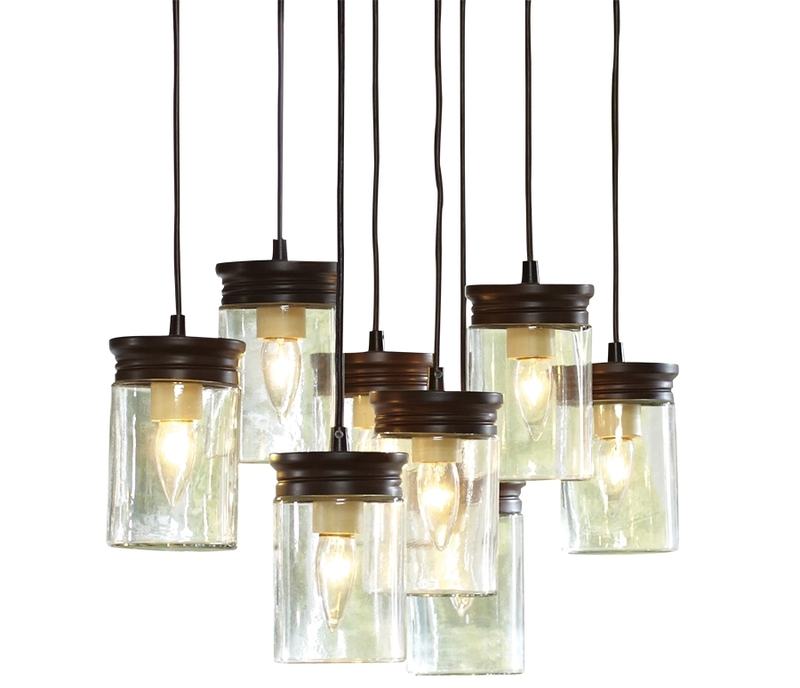 I also saw this one, also at Lowe’s, which I absolutely LOVE, but it costs a little more than I wanted to spend. But it would look really cool above the sink. If anyone knows how to make this for less than $100, I’d really like to know! Okay… Back to telling you what we’re doing. In the picture below, you can see the area that’s going to experience the most change. First of all, the cabinet above the stove is being replaced, because the one in the picture is too wide. That cabinet was taken down today, but we didn’t get the new one installed yet. The new microwave will be installed under the new cabinet. Then two open shelves will be installed in the space between. The bottom one will hold our toaster oven, and the top one will hold our glass pot lids. The base cabinet will be moved to another location in the kitchen, and a 27″ cabinet will go next to the stove. We’re doing that because we need three more inches of space so we can fit the dishwasher. All the cabinets are going to be painted white like the uppers. All the cabinets are going to be painted white, and I’m going to do beadboard wallpaper in the centers of the lower cabinet door like I did in the uppers. I was so pleased with how it turned out before, and the cabinets have held up really well…no complaints at all, so I’m sure I’ll be happy with how it looks on the lower cabinets too. Once the cabinets are all in place, we’ll replace the countertops with cherry butcher block. I know a lot of people get them from Ikea, but we’re going to get ours from Lumber Liquidators, because we can get them in a 12 length, which means no pieces them together, except behind the stove. The backsplash will be beadboard the same as we used in the bathroom. 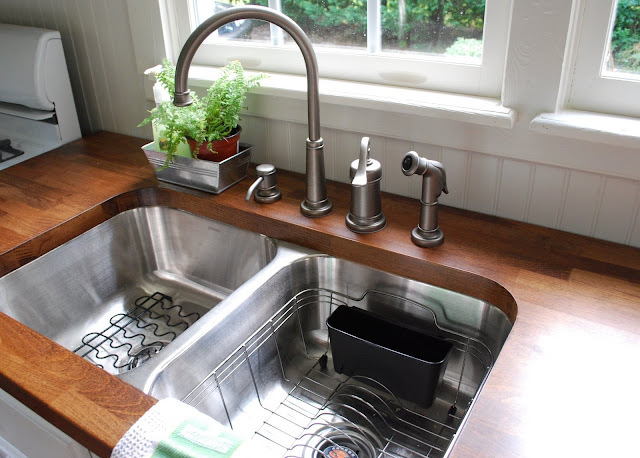 A few years ago, Vanessa at this & that blog posted about installing butcher block countertops with an undermount stainless steel sink. Her countertop and sink turned out EXACTLY how I want mine to look!! Here’s a picture of hers so you can see what I’m talking about. She even has the beadboard backsplash! Vanessa’s sink and countertop from this and that. Exactly what I want for my countertop and sink. I’ll probably be referring to her post quite often when we get ready to do the countertops. She did an incredible job of explaining the steps she did to finish the countertop and install the sink. Sounds like she has a very handy husband too. Believe it or not, I’m not finished telling you my plans yet. I am going to to replace all my drawer pulls. 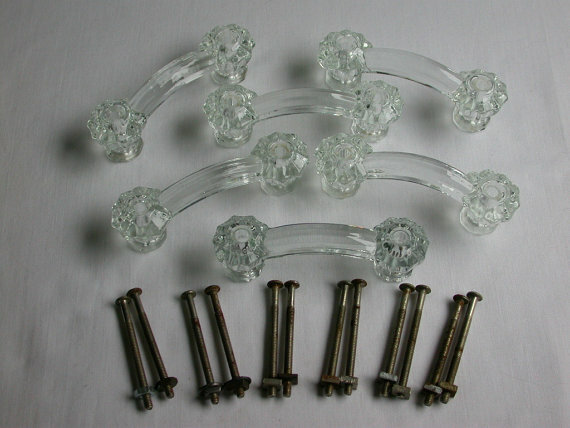 I know I just installed glass knobs a couple years ago, but I really wanted glass handles and I found vintage ones from the 1940s on Etsy, and there were the exact amount I needed. So I splurged and bought them from Karen at kadhivintageandmore on etsy. I’m keeping the glass door knobs, but the drawers will have these lovelies on them! I’m also planning a little surprise inside my cabinets and drawers. I’m going to paint the insides yellow!! I got the idea from a picture on Pinterest that I found. It was of white cabinets with the insides of the cabinets and drawers painted blue. Although I love the blue color, it doesn’t really go with anything in our living area. We don’t actually have anything that’s yellow either, but I had a yellow kitchen before and I loved it, and yellow and green go together. 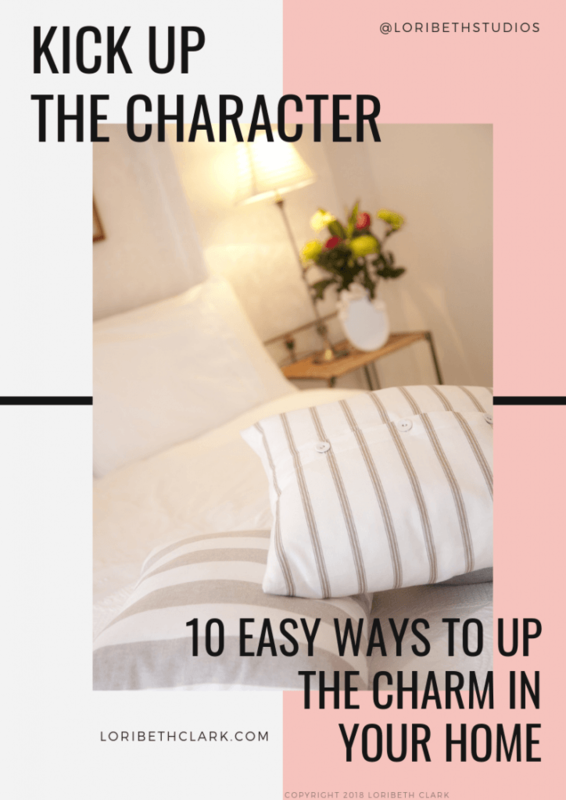 It will be a happy surprise every time I open a cabinet or drawer! Well, wish me luck and if you have any advice, please feel free to share!!! PrevPreviousBefore & After: Upholstered Chair!